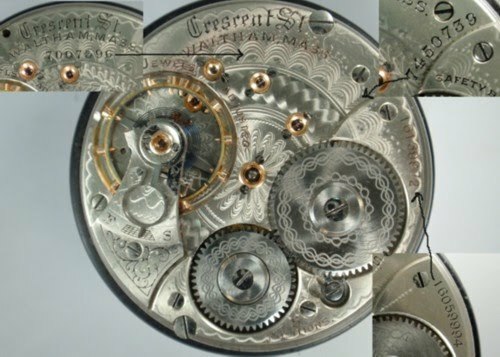 The serial number on the early Model 92 movements is big and bold, front and center. 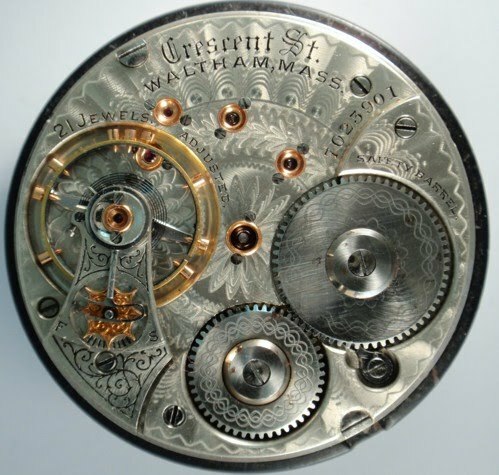 It is found just beneath the grade designation and the words “Waltham Mass.” When located here it is referred to as Serial Number Position 1 (SNP1). It will be found here on Model 92 movements through run 7022001-7025000. According to the Gray Book, this is a run of Vanguard grade movements but the Handwritten Records indicate that within that run, 7023501-7024000 are Crescent Street movements. [See table and photo below]. Twelve Crescent Streets have been reported in this range. The run is completed by Vanguards with the serial number at SNP1. Several Non-Magnetic Vanguards have been reported in the group previous to the Crescent Streets. Movements from the next run, 7025001-7025500, have the serial number at SNP2 and it will remain next to the barrel bridge up through run 10501201-10501500. At 10517521-10517800 it is moved to the barrel bridge, Serial Number Position 3 (SNP3), where it will remain until the end of production. Serial number run 10517501-10517520, just previous to the last mentioned run, is a run of Exports according to the Gray Book and no examples have been reported from this run so it is impossible to say at this time where the serial number is located on these movements.